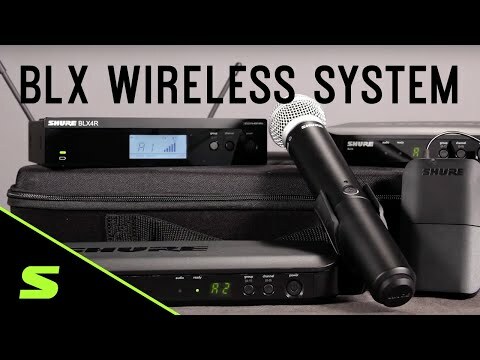 The BLX range of Shure wireless systems are the most affordable wireless systems in the Shure portfolio. The BLX288/Beta58 offers two radio .. The BLX range of Shure wireless systems are the most affordable wireless systems in the Shure portfolio. The BLX288/Beta58 offers two radio microphones in one box with a dual receiver and two Beta58 hand-held wireless transmitters. Precision built to the same requirements as higher end Shure wireless systems. Simple set-up and an easy to use interface. Performance that you can rely on. This bundle of two Shure Beta 58a wireless transmitters with the BLX288UK receiver is a must have for any professional performers who demand nothing but the best in vocal intelligibility, reliability and range. Perfect for the live stage environment, their supercardioid vocal pattern is super effective at eliminating unwanted feedback and sound sources whilst maintaining a detailed vocal response between 50hz and 15,000hz. A simple, intuitive interface makes it a breeze to set up and use right out the box, a sound engineer's best friend!